Sitting in a McDonald’s in suburban St. Louis, breaking my rule about eating fast food when I’m not on the road and trying out the latest Zune gimmick — free wireless access via Wayport at roughly 9,800 golden arch outlets across the US. First impressions: Way easy and way slow. It’s not just the Zune WiFi that’s sluggish; the free-with-food hour of Wayport WiFi on my laptop is slower than real ketchup. It took about 5 minutes to establish a connection, load the page and log on. You could finish a Happy Meal by the time you’re actually doing anything purposeful. As for the Zune, as soon as I went to the Marketplace area on my freshly updated 2nd gen 8G model, it started looking for the network. Once it found Wayport, it took two tries to get signed on but no codes were required and once the connection took, it went right to the screen with links to top songs, top albums, new releases. I started listening to the Mama Mia movie soundtrack as it streamed, then decided to download the whole thing (a free download of Pierce Brosnan singing? priceless). Zune asked if I wanted to add it to the “cart” then I had to go the cart and start downloading. It’s a clunky process but not difficult. The download started immediately. That’s the good news. More than 45 minutes later, it’s only at 57 percent. I had to give up listening to the soundtrack as it downloaded because it kept stuttering. Luckily, last night I downloaded an excellent new B.B. King album One Kind Favor using my wireless home network, a faster process, and it’s doing a very nice job of drowning out the flat-screen TVs tuned into the OJ trial. 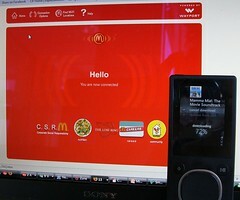 I’ll try streaming or downloading a song at a McDonald’s next time, but not an album. The Wayport process was much simpler than trying to use the WiFi on other out-of-home networks so far. I had absolutely no luck accessing it on T-Mobile at Starbucks; I could see the network but without a way to tell it my login, no dice. More about other features later. Can only stay at McD’s for so long. Update: Downloading works much faster on my home wireless network but persistent wireless use anywhere shares a characteristic to remember: more rapid battery drainage. The one album this afternoon almost took the battery to zero. And now I’m watching it dip perilously low on my 30 gig gen 1 Zune between FM listening and a download. — Another new feature, tagging a song you’re listening to on FM for later download, is a snap but that doesn’t mean the song will be there when you sync. One of my tests with K-Hits in St. Louis was a bit of a cheat — a Beatles song that I knew wasn’t online legally yet. The other was John Mellencamp’s Small Town and it didn’t show up either. — It’s hard to overestimate the value of having Zune 3.0 work retroactively across models and of having most of the accessories still fit as well even when the form factor changes. — The Zune has had wireless all along but this is the first time it feels relevant to the experience. — Music discovery goes to another level. The B.B. King album I mentioned above came from Top Albums under the Blues category. You can move across the art in new albums and see the options. Trying new music comes is one place where subscription music comes in handy. For searches, you spin through letter wheels to build the search term. — The new gaming feature comes with two free games: Hexic, which is addictive, and Texas Hold’em. Not sure I’d pay for more but I’d rather use the battery life for music. Thanks for the firsthand account. Very insightful. Wow, 90 mins. to download an album! No one would wait that long. 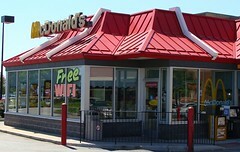 I can tell you that not all McDonald's have slow Wi-Fi. It's just a matter of the broadband options available to the McDonald's location. For example, one in my town tops out at 384Kbps whereas one across town hits 1.5Mbps. You mentioned this St. Louis location gives you a free hour with food. Do they give you a coupon for that? Most Wayport-McDonald's locations charge $2.95 for two hours. good-hearted character that is big supporter many charitable.